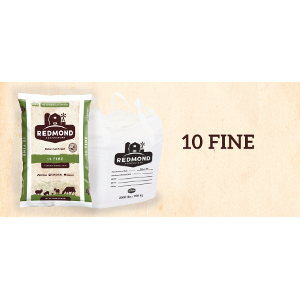 10 Fine is nature’s perfect balance to nourish your livestock. 10 Fine comes from an ancient sea salt deposit and has a broad spectrum of trace minerals. Animals instinctively crave salt that has naturally occurring trace minerals. Try it in your herd: put any salt or mineral next to Redmond 10 Fine and see which one your animals choose. 10 Fine has many trace minerals that livestock need. However, because of mineral deficiencies in some soils and feed, you may need to add additional minerals beyond what Redmond 10 Fine provides. If you contact us, we can help you with that too.